Does anyone play a musical instrument in heels, boots sandals. Can anyone play an instrument while wearing heels . 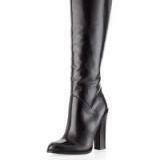 Elegant classic model thigh high leather boots: where?